Getting your baby to sleep through the night can be a challenge. It is the dream (ok, interrupted dream) of every parent of a little one. Sharing the night shift with your partner can certainly lighten the load of a baby who wakes up every couple of hours, but even that can’t go on forever! I’ve compiled this list of 11 tips to get your baby to sleep through the night to help parents everywhere. If your baby is getting up all hours of the night and keeping you & your spouse up, it only leads to longer days and longer nights. Let’s get our babies to sleep through the night and save our sanity! Studies have shown that babies who adhere to a nightly routine had an easier time getting to sleep and staying asleep. We, as humans, all need routine. It guides our body when to shut down for sleep, when to wake up for the day and when to eat. Similarly, babies’ bodies crave routine to help them know how to function. They don’t have the benefit of conscious knowledge of the benefits of sleep like we do, so what do they rely on? Their bodily signals. Unfortunately for those of us who prefer to sleep through the night, a baby’s need for food far outweighs the urge to sleep. This instinct makes it difficult to train your baby to sleep through the night. Keep activities the same, in the same order, for bedtime – i.e., maybe you always read a story to him at 8pm, feed him and put him to bed. Keep it up! Nap time should be regularly scheduled and provide enough sleep for your baby to make it through the day, without getting his days & nights upside down – this may mean your baby needs three 1-hour naps throughout the day, or potentially more or less! Learn how much sleep your baby needs and adjust as needed. Okay, this seems like a really simple straightforward tip, but it’s very important nonetheless. Change his diaper – yes, right before bed even if you just did an hour ago. That single pee may stand between sleep and a middle of the night leak, regardless of your diaper brand! Make sure he has a full belly – but not too full. You want your baby to feel full and satisfied and have the calories to make it through the night. But you definitely don’t want them so full that they wake up in the middle of the night throwing up or have to pee that one extra time (see my last point). Help them breathe – babies have a hard time breathing through their mouth at first, so clear nasal passages is a must! If they can’t breathe during the night, you can bet they’ll be waking up to tell you all about it! Ensure they are breathing through their nose easily and that nothing too fuzzy or dusty is near them since that can clog their nasal passages. Teething is a bigtime night stealer – if your baby is teething, be sure to do something to make them as comfortable as you can. Talk to your doctor about giving your baby a small dose of acetaminophen or baby orajel to help relieve the pain. A teething baby can prove quite inconsolable in the middle of the night. A comfy sleeper coupled with proper swaddling can work wonders for your baby when it comes to sleeping. Remember, they’re used to being cooped up in mommy’s womb, so being tightly snuggled in a soft sleeper and blanket goes a long way. It’s extremely common for babies to get nights and days confused, which directly leads to a baby who won’t sleep through the night. Have you noticed your baby is sleeping all day but then up all night? Your little night owl isn’t doing it just to mess with you, I promise. Your baby just spent 9 months in a dark womb, keeping his own sleep schedule. Why should he care if it’s light or dark around? He wants to sleep when he wants to sleep! Unfortunately most of us aren’t nocturnal like our little ones, so it’s critical that we correct this situation quickly. The best way to fix this is through routine (see tip #1). In addition to a good routine, try to keep your baby up more during the day. Yes, I know this is pretty difficult depending on your baby’s personality, but it is crucial to your success. If you see your little one doze off at the wrong time, try to gently wake him up and provide activity and distractions. Sticking to your routine and making your baby stay awake more during the day will help him figure out that light means awake, dark means sleep. 4. Put your baby to bed! 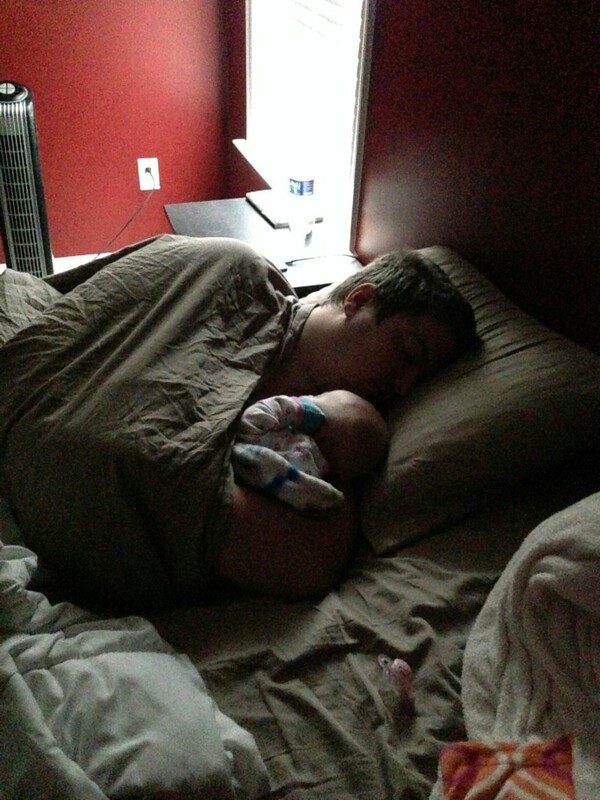 Sometimes co-sleeping is the only way to get them to sleep… but don’t get in the habit of it! Well duh, right? How’s your baby going to sleep at all, let alone sleep through the night, if you don’t put your baby in bed? Say what you will, but our babies have slept with us on the couch and in bed quite a bit during their short time with us. Sometimes William would refuse to sleep unless he could stretch out on our bed or snuggle with mommy or daddy. So we did! Of course that only encourages him to want that more, and sleep less on his own, but… it was really nice! Who doesn’t want to snuggle with a little bundle of joy while they sleep like a little angel? Yeah, no one. But seriously, it’s important to limit that kind of sleeping arrangement, and avoid it completely when you’re trying to sleep train your baby. Around 6 weeks old, you can start sleep training. Go through your bedtime routine, get your baby ready for bed and help your baby get drowsy. I find feeding to be very soothing for the little ones and will help you get them very sleepy. Of course the tendency is to simply finish the job, right? You just want to hold your tiny bundle and soothe him to sleep. But if you want to help your baby sleep through the night, it is critical that he be able to soothe himself. Put your baby down to bed while he’s still drowsy and let him drift off to sleep by himself. If you do it right, he’ll be close enough to just go ahead and sleep but still awake enough that he has to soothe himself a little. That is how you can start training him to self-soothe – a critical aspect of sleep training. Eventually he’ll be so good at self soothing that when he wakes in the night, he can put himself back to sleep. That, ladies and gentlemen, is the goal. We talked about comfort in number 2, but another part of comfort is safety. It is important that your baby feel safe wherever you expect him to sleep. Just like us, if a baby is uncomfortable or feels like he’s in danger, sleep will be hard to come by. Put him to sleep in a safe place and try not to move him once he’s down. That way, when he wakes in the middle of the night he’ll be able to get his bearings and feel at ease. A quiet, peaceful atmosphere is a perfect place to sleep so do your best to create one, especially in a new place. It is also important to make sure you’re extremely comfortable with how safe your baby is at any given time. SIDS is a real concern and the numbers are still shockingly high. If you aren’t absolutely 100% comfortable with your baby’s safety for whatever reason, you’re going to be more tempted to check on him – especially with your first. Of course checking on your baby can wake him up and we don’t want that. Follow these steps from WebMD to help prevent SIDS. For more information about SIDS and how to prevent it, check out the American SIDS Institute. The sleeping area should be dark, at least mostly. Darkness is more conducive to sleep. The room should be a temperature that is comfortable for your little one – too hot and he’ll wake up all sweaty; too cold and he’ll wake up shivering. This typically means the room should be around 70 degrees F. That is a perfect middle temperature where you don’t feel the need to give a blanket because his sleeper is just the right amount of warmth. Relative humidity in the room should be around 50%. If the air is too dry, your baby may get a stuffy or even bloody nose. If humidity is too high, you risk mold and will make the room feel warmer. I suggest a warm-mist vaporizer or cool mist humidifier to keep the proper humidity in the room. Not only does this make your baby more comfortable, but it also helps your baby feel better when he’s sick. Our humidifier proved vital when William came down with croup. When your baby is little (up to 12 weeks or so) sleeping in a reclined swing can be great. That’s what we do with our little ones. It helps them stay asleep and start to learn to self soothe. A crib or pack-n-play gives your baby more space to stretch out, which is something babies crave as they get older (at least mine do). My son sprawls out from one corner of the crib to the other now. If your baby wakes up with an upset tummy throughout the night, raise one side of the crib to help them keep the milk down. If your baby has trouble with separation from mommy or daddy, leave something near them that smells like you, like a stuffed animal or a shirt. You could also play continuous recording of you singing softly to your baby. Just do something to let them know you’re right there. When your baby sleeps through the night, you sleep through the night! Best of luck to you all! If you have any questions, comments or stories to share about getting your baby to sleep through the night post them below! I look forward to exchanging stories with you all. As always, if you want to share your advice or stories on this blog, you can contribute to The Super Daddy! These tips are awesome. You have a great blog and I look forward to reading more of your tips. Thanks Briana! I’m glad you liked them. There’s more tips and stories coming so be sure to subscribe! ???? That’s always helpful for sure! Especially when kids are bit older so you can have them running around outside and whatnot. Thanks for sharing!